Thom Stecher and Associates is dedicated to assisting schools, educators and students in achieving their highest level of potential. We strive to foster open relationships where the sharing of ideas, philosophy, knowledge, beliefs, values and passion is channeled into creating constructive solutions. We aim to build healthy communities where we grow as instruments for positive change. 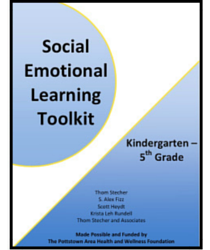 The Social Emotional Learning Toolkit for Kindergarten to 5th grade is designed to be a resource for teachers, counselors, school staff, and administrators who are focused on integrating social emotional learning with academic rigor. It offers practical, engaging, and developmentally appropriate activities based on theory and best practices of whole child-focused education. 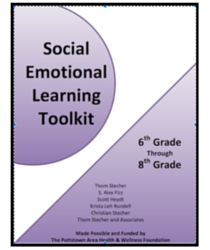 The Social Emotional Learning Toolkit for 6th to 8th grade is an ideal resource for implementation of a middle school advisory or advocacy program. These tools, discussions, activities, and lesson plan ideas are also possible in an extended homeroom or integrated into any content area. Our experience in helping schools establish advocacy programs, supported by research (Payton et al. 2008), shows improvements in academic skills, social and emotional skills, and behaviorial concerns.